Is making fake sweat Apple’s least glamorous job? When you create products that are in constant contact with the skin, it’s vitally important that those devices can withstand the everyday conditions and substances they're going to encounter – and that includes sweat. 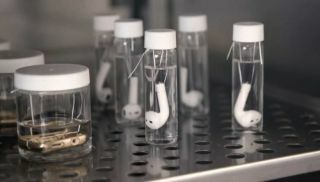 When a Vice correspondent recently visited Apple’s HQ for a piece about its environmental impact, she discovered that there's a lab technician whose duties include producing half a gallon of fake perspiration every day. We don't know that lab tech's identity though – and we're not sure they'd want to brag about their job. While making sweat may seem like a simple task – just add some salt to some water – there's actually a bit more to it. In fact there's an entire industry around fake sweat, with companies like Pickering Laboratories producing a vast range of ready-to-use ‘artificial eccrine perspiration’ with a variety of different minerals and amino acids at a range of different pHs. How products that are in constant contact with sweat react to such substances is a major factor in their longevity – hence Apple suspending its devices from floss in bottles of fake sweat all day. All this fake sweat could have another function too. One of the features that Apple was originally working on for the Apple Watch was a sweat detector, and while this feature has yet to present itself, there's a very real possibility that we could be seeing this as a future development. A patent recently filed for the Apple Watch shows a modular strap that looks very much like a standard metal watch strap, but with interchangeable links that each have their own functions. When CNBC reported the finding the patent, it claimed the functions of the units could include solar panels, haptic feedback, wireless transmitters, and health detection units such as thermometers, blood pressure sensors and sweat detectors. With the recent information about Apple Watch potentially being used for diabetes detection, this modular strap idea could be a good way for Apple to create medical tools for the Watch without the device itself being registered as a medical device, saving it from having to go through the FDA approval process that would slow development timelines. So while being Apple’s sweat-maker may not be the most glamorous job going, it may turn out to be pretty important in the long run.